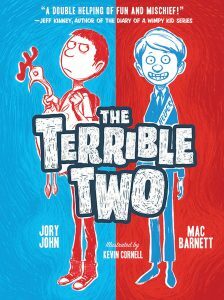 The author of 29 books for children, Mac Barnett ’04 is always looking for stories that elicit strong feelings. 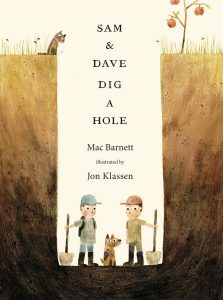 New York Times–bestselling and award-winning children’s author Mac Barnett ’04 started reading at the age of 3. As he was growing up, it was just Barnett and his mom. They didn’t have a lot of money, but Barnett says it was important to her that they had books. So they bought all of Barnett’s books secondhand—or third? fourth?—at yard sales. “I grew up with the generation of children’s books before me and the generation before that,” Barnett says, noting that his collection spanned the years from 1935 to 1975. Barnett cites some favorite authors and books from his half-pint days: Margaret Wise Brown, James Marshall, Wanda Gág and “The Frog and Toad” series by Arnold Lobel. Books like those became touchstones for him in his writing, he says, and still evoke a particular set of memories: reading aloud with his mom and telling inside jokes in their family. They found some books ridiculously absurd and others heartbreaking. The best books, he says, made them feel something. For Barnett, there is no barrier between his work and the rest of his life. Those “alive” ideas can come from anywhere. Barnett first started crafting children’s stories when he was in college during his summers. He worked at a summer camp, telling original stories to the camp kids. He’d make up stories about his life: adventure stories, espionage stories and more. In the telling is where he found his dream. Barnett spends a lot of time on the road, visiting elementary schools and reading out loud to children. They are who he keeps in mind when he’s building an imaginary world; he pictures himself standing in front of a big group of kids and holding their attention with a book. When he first told his Pomona College mentor, the late Professor David Foster Wallace, that he wanted to write for children, Barnett says Wallace winced. He said he didn’t have any advice to offer Barnett on how to write for children. But Barnett replied that he already knew how to talk to kids. He needed to learn how to write. He says Wallace’s counsel to respect the reader and always consider his audience was huge in his development as a writer. Develop he did. Barnett has been writing full-time for 13 years, and in that time, he’s written 29 books. But Barnett is modest when he’s complimented on being prolific. He describes his process as a mess. There are a lot of scraps. There’s a lot of sitting. Indeed, something is happening because Barnett is winning lots of recognition, and his books have sold over one million copies, been translated into more than 30 languages and racked up awards like the E.B. White Read-Aloud Award and (the icing on the cake for every children’s book) two Caldecott Honors. 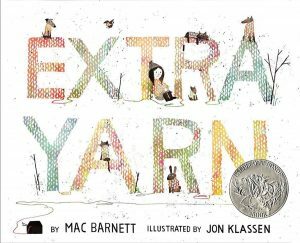 Barnett is quick to say that it’s actually the illustrator who gets the Caldecott award, not the author. “They don’t even give me a certificate,” he says, laughing. Still, even though it’s not technically his, seeing that Caldecott sticker on his books is very satisfying. He remembers that while growing up he was always attracted to books bearing that sticker. He remarks that it’s amazing that it means so much to readers even that young. Books and memories that young readers carry into adulthood are one day passed on to their own children, he says. Barnett is keenly aware of the audience he’s working for. People will tell him kids love horses, kids love robots—but he thinks it’s both simpler and more complicated. Kids love a good story. And lots of different kinds of stories. 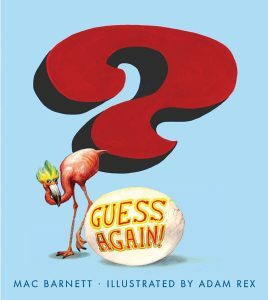 Barnett’s three favorite books of his own are a motley collection themselves: Guess Again (2009); Leo: A Ghost Story (2015); and his most recent, The Wolf, the Duck, and the Mouse (2017). He loves Guess Again because it is the lightest in tone, full of jokes, and yet his most philosophical work. 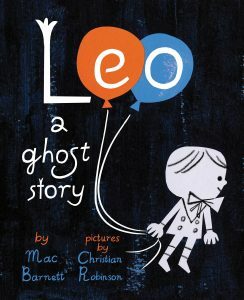 His affection for Leo is due to Christian Robinson’s illustrations and the subject matter, which is a paean to friendship. 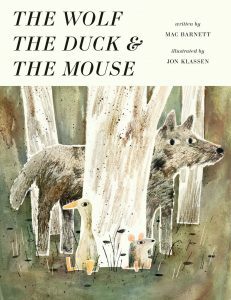 The Wolf, the Duck, and the Mouse is special to Barnett because it poses big questions about life, death and why bad things happen—questions he wrestles with and that children pose all the time. It’s a tough audience, Barnett says. The good part: his crowd isn’t fanboying and fangirling over him the way grown-up audiences can do to their favorites. The kids are there because they care about the book; they’re not fawning over the author, he says. But because they care about the book, they keep it real. Really real. “They will just tell you anything they don’t like about the book.” And Barnett says he takes all of the criticism seriously. Kids offer other kinds of fun-size observations as well.